We know that change is inevitable. But what's really important is how we as individuals and organizations navigate through change when confronted with it! Research shows that when major change occurs, our productivity can significantly be impacted... to the tune of a loss of 2 hours per day! 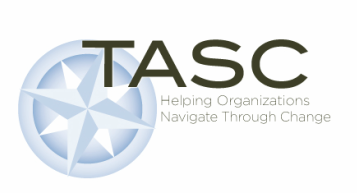 TASC is dedicated to helping you and your employees navigate through change whether it be a technology change, new work process, organizational strategy, merger/acquisition, or you name it! Partner with you to implement your change!